Scientists and engineers who work with materials – metals, polymers, ceramics, composites, and glasses – know that at some scale, predictive ability breaks down amid the fluctuations known as "stochasticity." On the atomic scale for example, even the most perfect crystal has thermodynamic fluctuations, in the form of "point defects" – atoms missing from the crystal lattice. In another example, the atoms within an alloy material may distribute in many ways: an alloy made of silicon germanium, may be half and half of each element overall, but with stochastic fluctuations the ratio in which those elements are found varies at different length scales throughout the material. "We propose a new framework for understanding stochasticity as an important unifying phenomenon across materials," said Robert Hull, the Henry Burlage Professor of Engineering and director of the Rensselaer Center for Materials, Devices, and Integrated Systems, and lead author of the paper. "There is an opportunity in taking a larger view of stochasticity – in expanding our view from individual observations based on a sole class of materials to a broader perspective across materials – for greater control over both the challenges and potential benefits it offers in materials science and engineering." Hull was joined on the paper by Rensselaer colleagues Pawel Kelinski, professor and head of materials science and engineering; Dan Lewis, associate professor in materials science and engineering; Antoinette Maniatty, professor of mechanical, aerospace, and nuclear engineering; Vincent Meunier, the Jeffrey L. Kodosky '70 Career Development Constellation Chair and head of physics, applied physics, and astronomy; Assad A. Oberai, former associate dean of the School of Engineering, now at the University of Southern California; Catalin Picu, associate head mechanical, aerospace, and nuclear engineering; Johnson Samuel, associate professor of mechanical, aerospace, and nuclear engineering; Mark S. Shephard, the Elisabeth C. and Samuel A. Johnson '37 Professor in Engineering; Minoru Tomozawa, professor of materials science and engineering; Deepak Vashishth, director of the Rensselaer Center for Biotechnology and Interdisciplinary Studies; and Shengbai Zhang, the senior Gail and Jeffrey L. Kodosky '70 Chair in Physics, Information Technology, and Entrepreneurship. "The fact that the internal structure of materials at some time or length scale becomes non-uniform and non-predictable is a phenomenon which underpins almost all that we do, and yet we only have piecemeal information on its effects," Hull said. "We think materials stochasticity as a distinct field of study could yield valuable insights that will advance our ability to understand and manipulate materials." The paper reviews four "broad classes" of stochasticity in materials: thermodynamic fluctuations, structural/compositional fluctuations, kinetic fluctuations, and frustration/degeneracy. It also considers stochastic effects arising from imprecision in measurement and uncertainties in modeling and simulation. Kinetic fluctuations, for example, are temporal fluctuations in the development of the internal structure of materials (the "materials microstructure"). 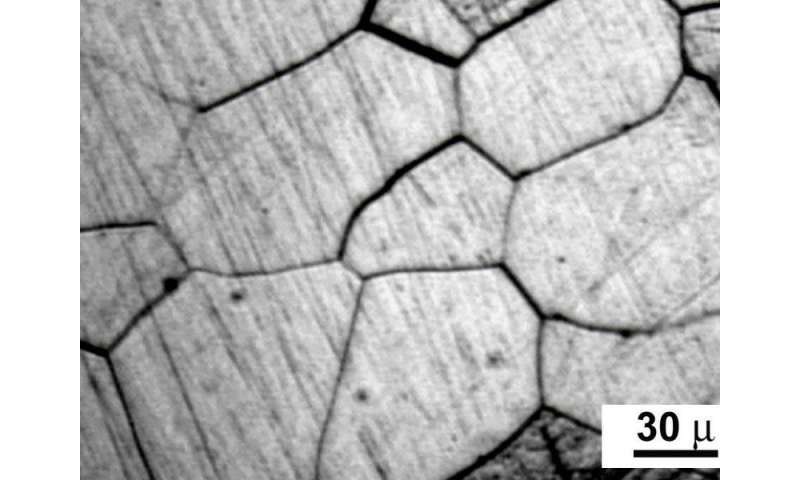 A well-known example is seen in metallurgy, where heat and stress are used to alter the internal structure of metallic alloys such as steel. On a microscopic level, steel, made of iron and carbon and other elements, forms locally distinct regions called "grains" and "phases." The distribution of grains and phases and their characteristic sizes are dependent on kinetic fluctuations during the processing of the material and affect critical engineering properties like tensile strength and ductility. The history of steel processing, spanning millennia, is essentially an attempt to use heat and stress to control grain size and phase distribution and therefore optimize its properties. Finally, the researchers perceive potential advantages to harnessing stochasticity. Typically, the fluctuations of stochasticity are considered a challenge to be controlled and mitigated. But it's possible, the researchers wrote, that a greater understanding of stochasticity will reveal situations under which the inherent fluctuations of materials yield new materials properties. "Nature has given us a finite number of elements, and ways to combine them," Hull said. "Perhaps, within stochasticity, we can find new degrees of freedom within the material set which have previously been unrecognized." "Stochasticity in materials structure, properties, and processing—A review" appeared in the March 2018 edition of Applied Physics Reviews. Years ago I used solidified carbon dioxide (dry ice) to cool my germanium crystal set radio. Cooling stopped the drift off frequency which I later discovered was due to the stochastic instability of the germanium crystal at room temperature. At some point, add logic to your math; you might see causality! I knew it! Reality is a "Drunkards Walk". No matter what your analysis, the total result at any point in time is due to the spherical fields updates; the more updates the hotter or som'n like that. So yes, everything is a superposition of fields; so, controls. Exploration?